Marine Corps photos by Sgt. John Martinez, Lance Cpl. Olivia G. Ortiz, and Sgt. Tyler Main. 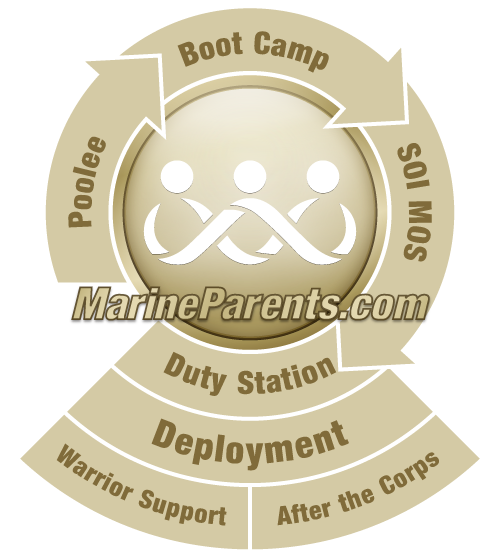 The Marine Corps has a long and storied past with many milestones along the way. One major milestone came in 1918 when Opha Mae Johnson became the first female to enlist in the Marine Corps. Since then there have been numerous events to occur that show the importance of women in the Marine Corps. Female Marines are seeing their roles expand much more recently. The Marine Corps has opened up all combat arms career fields to women. Although there are more opportunities, women still make up a very small percentage of these jobs, as well as the Marine Corps as a whole. There are approximately 14,000 female Marines which makes up about 7% of all Marines today. In the last five years alone female Marines have attended infantry training, both enlisted and officers, and have attended the School of Infantry on the west coast for the first time ever. Female Marines are continuing to represent the Marine Corps and have great success even after their active duty service has come to an end. Sergeant Julia Watson, in 1998, became the first and only woman to win the National Individual Trophy (Daniel Boone Trophy) for rifle marksmanship since the competition began in 1902. She also won the NRA Service Rifle Championships three times while on active duty, and is currently the only woman to have won the competition. Also, Chief Warrant Officer Roxanne Conrad (Ret.) was the first woman ever to earn the International Distinguished Shooting Badge which is the highest shooting badge a Marine can wear out of the 52 shooting badges authorized for wear in uniform. The year 2018 marks the centennial of women in the Corps. Let's celebrate the fewer and the prouder! The history of women in the Marine Corps is full of broken barriers and major accomplishments. There is undoubtedly many more accomplishments to come as the female Marines of today will continue to build upon the foundation and legacy of Marines that came before them. Click here to earn more about women Marine history. 1950 - The evening dress uniform for Marine Corps women officers was introduced for the first time by Colonel Katherine A. Towle at the Marine Corps birthday ball at the Sail Loft, Naval Gun Factory, Washington, D. C.
1997 - Karen Fuller Brannen became the U.S. Marine Corps first female strike fighter pilot to earn "wings of gold." 2013 - Brigadier General Lori E. Reynolds, first female Commanding General of a Marine Forces Command: U.S. Marine Corps Forces Cyber Command. 2015 - Col. Julie Nethercot, the first female commander of Officer Candidate School in Marine Corps history. 2016 - Colonel Wendy Goyette, first female Commanding Officer to command an Operational Forces Command and the first commander of Marine Corps Cyberspace Operation Group. 2018 - Lieutenant General Lori E. Reynolds, first female Deputy Commandant of the Marine Corps: Deputy Commandant for Information. Opha Mae Johnson: First Female Marine. Public Domain. Ruth Cheney Streeter: First Director of Women Marine Reservists. Public Domain. Barbara Olive Barnwell: First female to be awarded the Navy and Marine Corps medal. Public Domain. Annie E. Graham and Anne E. Lamb: First two African-American female Marines. Public Domain. Rose Franco: First hispanic female Marine to be promoted to Chief Warrant Officer. Public Domain. Ruth Wood: One of the first women to enter the warrant officer program. Public Domain. Female Marines Timeline information provided by the Women Marine's Association. Designed by and sold only at the EGA Shop. 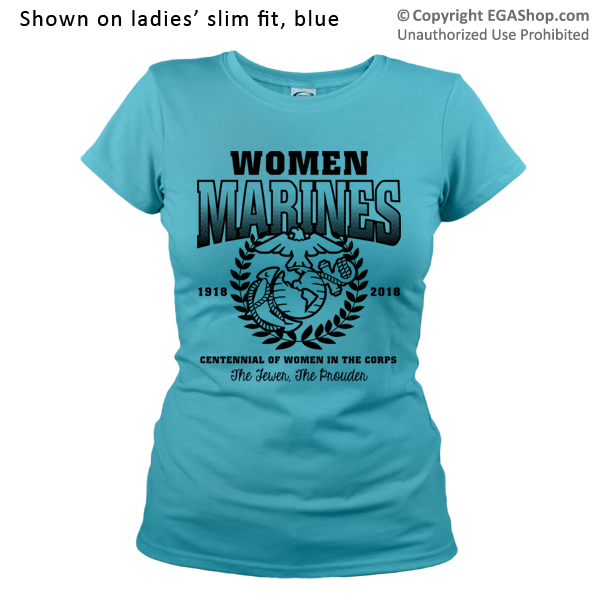 Women Marines Centennial T-shirts designed by the EGA Shop. Click here to buy now.